After a morning hotel pickup, your informative guide takes you to El Meco, a Maya archaeological site located just outside of Cancun that visitors often miss. 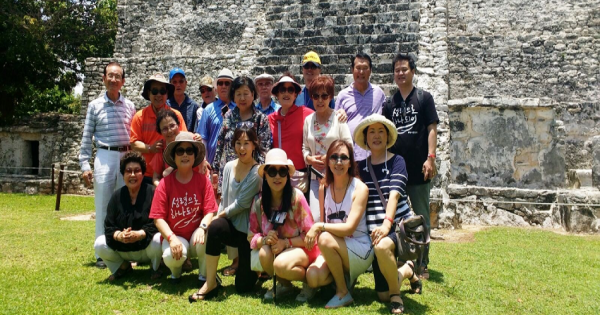 During a 45-minute tour, learn about its history and enjoy free time to appreciate the ruins on your own. Back in your air-conditioned vehicle, continue to ‘Celso’ at Market 28, where you’ll enjoy an authentic marketplace experience. Interact with local vendors offering handcrafted artefacts at flea-market-type shops, pick up real silver from Taxco at the best prices! Your guide then shows you Cancun’s landmarks, including those in the downtown district and hotel zone. Next, a trip to the past visiting the Casa Maya Museum where you will witness how Cancun has developed back from 1968 to nowadays. Discover how the Mayans live in rural areas and admire local wildlife at Parque Kabah, a State Protected Natural Area, popular among locals. Travel along Boulevard Kukulcan for views of Cancun hotels, clubs and marinas. In Plaza Kukulkan, enter the Tequila Museum, which houses 700 types of Mexican tequilas. Learn about the various brands and enjoy a tasting here. Score duty-free prices on brand names at designer stores. Cap off the day with jaw-dropping views of the Cancun bay and coastline at El Mirador in Playa Delfines (this stop is subject to weather conditions). Take a commemorative shot next to the famous and colourful Cancun sign that has become a must for visitors. You’ll be transported back to your hotel in the late afternoon, with unique purchases and memorable photos in hand. Meeting place at Oasis Smart, Av Tulum 13-14, capilla ecumenica, 22, 77500 Cancún, Q.R. Hotel and designated meeting points pick up available in Cancun, Playa del Carmen and Riviera Maya. (Please verify your hotel location. If you are staying in Riviera Maya, Cozumel, Playa del Carmen or any other location outside Cancun you must select “Riviera Maya” option.) Pick ups commence 30 to 60 minutes prior tour starts. An exact pick up time will be advised a few days after confirmation.